While there are abandoned towns all over the world, it is the ones in the United States that have captured the haunting beauty and the romance of a bygone era. These places are so perfectly frozen in time that many visitors may not be able to help but feel like an entire population suddenly vanished just moments before their arrival — even if people haven’t occupied the area in decades, maybe even centuries. American history created the perfect conditions for the rapid building and subsequent disintegration of entire communities: between the rush for riches in the 1800’s and the modernization of America that occurred soon after, even towns thousands of people strong were abandoned. Now, visitors are thrilled to hear about the sometimes spooky history of these ghost towns — and, if they’re lucky, maybe even witness some paranormal activity for themselves. Here are 7 abandoned towns in the United States whose creepy yet cool reputations precede them. In the late 1870’s, this former gold town in the Sierra Nevada Mountains located along the California-Nevada border boasted nearly 10,000 residents. It was a bustling town with saloons, a red-light district, and perhaps even opium dens. Eventually, both the money and the luck of the residents ran out. Mining profits declined, and people filtered out of the town until 1942, when its post office finally closed. Only a small part of the town survived, and about 110 structures still stand. Some stores are still stocked. However, visitors are warned that, if they take an artifact from the town, like a piece of glass or a nail, bad luck will befall them. The only way they can restore their luck is if they return that artifact to Bodie. And sure enough, park ranger Mark Langner says that a few anonymous visitors return what they took with a note apologizing. Lake Tahoe is the closest area with living residents, and is about 75 miles away from Bodie. Once upon a time, St. Elmo was a mining village and railroad stop complete with hotels, dance halls, a school, and a telegraph office by the 1870’s. But by the 1930’s, the railroad closed and the last of its residents left on the last train out of the town. Only one woman named Annabelle stayed well into the 1950’s, and some visitors have claimed to have seen her spirit around town, guarding it. Because St. Elmo now has a few residents again, visitors can still purchase goods and antiques in the General Store, rent four-wheelers, and stay in a rustic cabin in town. The closest town, Buena Vista, is located 20 miles away. 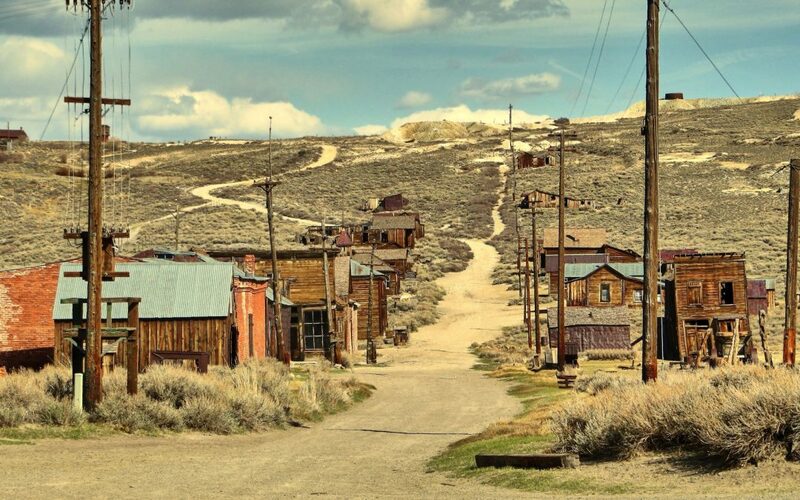 Though still inhabited, St. Elmo is considered to be a well-preserved ghost town. Centralia’s fate seems sealed: since an abandoned coal mine caught fire in 1962, a fire has been burning underground ever since. That’s not all: the fire is expected to burn for the next 250 years, and is causing noxious gases to spew out. Now, chemical exposure, water contamination, and air pollution are preventing the town from being livable. Technically, Centralia is not quite a ghost town. Though most of its residents evacuated after the fire broke out and never returned, a few stayed behind. As of 2013, there were 7 people still living in town. This former mill town may have been able to produce $200 million worth of copper ore between 1911 and 1938, but was ultimately too remote to survive. It’s located at the end of a 60-mile dirt road in the middle of Wrangell–St. Elias National Park and is located 60 miles away from the closest town, Chitina. But back when it was operational, it was a company town with a hospital, a school, and even a skating rink and a tennis court. Tours of Kennecott are regularly given, though state officials have made regular efforts to redevelop the area. However, it is said that paranormal activity has thwarted every attempt. Kennecott is said to have the greatest concentration of paranormal activity in Alaska. Rhyolite, located near present-day Death Valley National Park, was founded in 1905, and by 1907, it had everything a bustling town needed, including electric lights, water mains, telephones, newspapers, a school, an opera house, a hospital, and a stock exchange. Its population is estimated to have peaked at 3,500 to 5,000 in 1907–08. Rhyolite’s rise is attributed to the promise of gold. But the town’s demise arrived just as quickly as its heyday: within just a few years, people started leaving when the riches never came. In the 1920’s, the town was used as an old-West movie set. Now, visitors can see the old buildings, including the notable Bottle House. The closest signs of civilization are in Death Valley National Park and Beatty, NV. Like its name suggests, this tiny Arizona town was built for the Christmas spirit! In fact, its sole purpose when it was built in the 1930’s was to draw in tourists and to sell real estate. Everything from the inns to the restaurants had a Christmas theme. Kids could even “meet” Santa Claus any time of the year and could even “receive” a letter from the jolly figure. The popularity of Santa Claus declined in the 1970s and the town, four acres large, has been for sale since 1983. Today, you can still see the vandalized buildings, an old wishing well, and the famous pink children’s train, the “Old 1225,” now derailed. The closest operating town is Kingman, AZ.